The internet is amazing. Such a constant flow of great information. You just have to know which rocks to look under. And the Brain Pickings rock offers some gems. 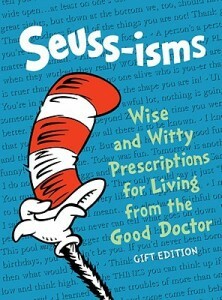 I’ve added quite a few books to my “wish list” after a Brain Pickings post, but this could be my favorite. The Dude is a giant fan of Dr. Suess. The poetry is infectious, and the philosophy is perennial. The Good Dr. has just as much to teach adults as kids. Not sure how I’ve missed this all these years, but I am jazzed to find Seuss-isms: Wise and Witty Prescriptions for Living from the Good Doctor. Thank you Brain Pickings. The Dudes are going to enjoy philosophizing with the Good Dr.
By the way, you should peruse the B.P. for other super cool book recommendations as well. This entry was posted in Books, Curration, Dude, Life Lessons, Philiosophy and tagged Brain Pickings, Dr. Suess, Dude, Suess-isms. Bookmark the permalink.